One of the issues which I have been exploring and mulling over the past year and a half on this weblog has been the idea that population movements were much more extensive in the past than we have thought until late. I can say a year and a half because my thinking was clarified and made more urgent by the publication in January of 2010 a paper which totally overturned what we’d thought we’d known about what Y chromosomal phylogeography told us about European prehistory. A very common marker in Western Europe which had been assumed to be diagnostic of roots in Europe in the Pleistocene past was now argued to be a signature of the pulse of farmers out of the Middle East! The extremely high frequency of this marker among the Basques, and the presumption that the Basques were the Paleolithic ur-Europeans, allowed researchers in the early 2000s to peg the proportion of Paleolithic hunter-gatherer ancestry across Europe on the order of ~75%. At this point we don’t have total clarity, though I would argue that we need to lean ever so slightly toward accepting the proposition that the contemporary genetic landscape of Europe is an artifact of massive replacements and assimilations which occurred between five and ten thousand years ago. In this reformulation the Basques are the last cultural links to a wave of farmers which swept out of the eastern Mediterranean, and were either genetically or culturally overwhelmed across much of their range more recently. This reconsideration of deep time prehistory forces us to reconsider the nature of the margins of genuine history. Last spring I reviewed Peter Heather’s timely Empires and Barbarians: The Fall of Rome and the Birth of Europe, which made the case for a more serious acceptance of the supposition that the fall of the Roman Empire and the shift to the Dark Ages was accompanied by mass folk migrations of Germanic peoples across Europe (i.e., not just men on the move, but their wives and children as well). The fashionable archaeological and historical view of the past few decades has been that in fact the switch from Roman to post-Roman was in many ways superficial, and certainly did not involve arrival into the Empire of massive numbers of people. Many historians even produce an anthropologically inflected model whereby tribes such as the Visigoths are relatively recent ad hoc social constructs with little more than fictive ethnic connotations. Heather disagrees with this for various reasons, as do I. For the purposes of this post though I want to highlight one portion of the narrative in Empires and Barbarians: the in-migration of the Germanic warriors and their families into the Roman Empire as federates also involved a depopulation of the vast eastern hinterland of what was once Germania. As if by a law of social physics this led to a prominence of the Slavic peoples, who percolated west as bands of German warriors took service in the wealthy barbarian post-Roman kingdoms of the south and west. To give an example of the wide scope of the latter dynamic, while one group of German Saxons famously emigrated to Britain, others are known have entered Italy to serve the Goths and later the Lombards! And so it came to be that as the year 1000 approached much of what was in antiquity Germania was part of Slavdom, up to and including broad swaths of what even today are integral portions of the German cultural sphere along the Elbe. What happened? The Ostsiedlung, the German push toward the east in the early medieval period which extended down to the past few centuries (e.g., the settlement of regions of the Volga by German peasants at the behest of the German princess turned Tsarina Catherine the Great in the 18th century). Even after the mass expulsions of eastern Germans after World War II and the redrawing of the border between German and Poland so it was far to the west of where it had been, the modern expanse of greater Germany includes regions which were “reclaimed” from the West Slavs during the Ostsiedlung. We know this because not all Slavs were marginalized or assimilated. The Sorbs bear witness to this, as they are a Slavic ethnic group which is still resident as indigenes on the eastern fringes of modern Germany (they were enveloped by German speakers before the flight of eastern Germans in the wake of the defeat of the Nazis). To understand where the Sorbs came from you have to know a little bit about what I think of as the “forgotten Crusades,” the centuries long bludgeoning of the pagan West Slav and Baltic people by Christian Germans, ostensibly for the purposes of spreading the faith to the heathen, but also clearly with obvious proximate material causes and incentives. This latter motivation is made obvious when one notes that after the conversion or extermination of pagans the German “religious” military orders continued their campaigns against Catholic Poland and Lithuania! (recall this predates the Reformation) The last pagan Lithuanians were resident not within Lithuania itself, but were chattel on the lands of German landlords, who like some American Southerners discouraged or impeded the Christianization of their property because of worries about the heightened scrutiny it might entail from the religious authorities as well as the demands which might issue from their new co-religionists. This is not the place to tell the tale of how the West Slavs were swallowed by the tide of German Christianity (West Slavic converts to Christianity in fact are known to have declared their allegiance to the German God, so confounded was the faith with German culture). But one does have to consider a question: to what extent are the Germans of the eastern Lander Germanized Slavs, who obtained their ethnicity along with their new religion? Population isolates have long been of interest to genetic epidemiologists because of their potential to increase power to detect disease-causing genetic variants. The Sorbs of Germany are considered as cultural and linguistic isolates and have recently been the focus of disease association mapping efforts. They are thought to have settled in their present location in eastern Germany after a westward migration from a largely Slavic-speaking territory during the Middle Ages. 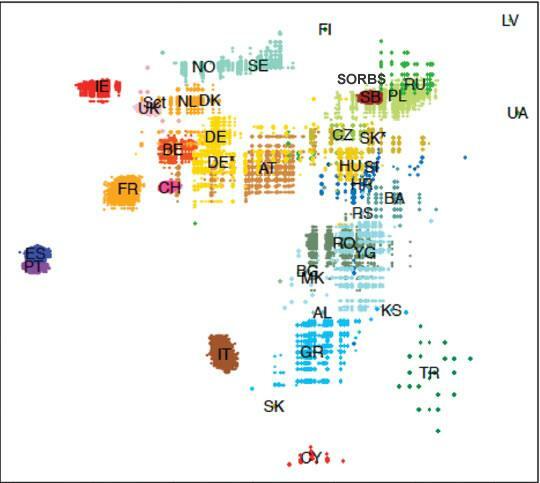 To examine Sorbian genetic diversity within the context of other European populations, we analyzed genotype data for over 30 000 autosomal single-nucleotide polymorphisms from over 200 Sorbs individuals. We compare the Sorbs with other European individuals, including samples from population isolates. Despite their geographical proximity to German speakers, the Sorbs showed greatest genetic similarity to Polish and Czech individuals, consistent with the linguistic proximity of Sorbian to other West Slavic languages. The Sorbs also showed evidence of subtle levels of genetic isolation in comparison with samples from non-isolated European populations. The level of genetic isolation was less than that observed for the Sardinians and French Basque, who were clear outliers on multiple measures of isolation. The finding of the Sorbs as only a minor genetic isolate demonstrates the need to genetically characterize putative population isolates, as they possess a wide range of levels of isolation because of their different demographic histories. The purpose of the paper then was to characterize the distinctiveness of the Sorbs in relation to other European groups as well as their distinctive characteristics. One has to keep in mind two parameters of interest in how population structure emerges: geography and culture. Clearly populations which are far apart in space are going to be genetically distinct. Over time genetic drift will introduce variants private to that group, and greater distance will reduce the power of gene flow to equilibrate between population variance. But it isn’t just simply distance which matters. Particular details such as terrain or bodies of water have a major effect. The second variable is culture. Groups like the Ashkenazi Jews and Gypsies have been resident among various European ethnicities, but gene flow has been retarded by cultural differences. The two examples given as comparisons to the Sorbs for genetic isolates are the French Basques and Sardinians, and I believe they illustrate both parameters. The Sardinians are sealed off by water from the European or North African mainland, and so have had time to develop their own genetic distinctiveness. After for the Basques, certainly geography matters, but I suspect the linguistic differences between them and the post-Latin speech of their neighbors served as a check on gene flow (and before that, Celtic, Gaulish in what is today France and Celtiberian in Spain). Not only that, but the Sorbs are not nearly as genetically distinctive using measures like Fst (between population difference) with their neighbors nor do they exhibit the signatures of isolation like the Sardinians or Basques. 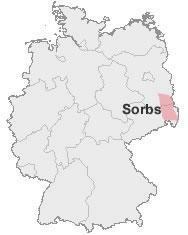 Obviously Sorbs are not geographically separated like the Sardinians. They’re naturally going to have experienced gene flow with Poles, Czechs, and Germans, who are their neighbors. Additionally there is likely going to be a particular affinity with other Slavic groups, especially for groups like Catholic Sorbs who would have no confessional barrier to intermarriage with other West Slavic populations. One caution regarding our results is that the geographical origins of our reference populations are crudely characterized only by country and thus may not be random samples. If many of the Germans in the POPRES data are western German samples, this may inflate the apparent differences we observe between Germans and Sorbs. The LPZ Germans contained two individuals from Eastern Germany who do appear closer to the Sorbs, suggesting that population structure within countries is a valid concern. Certainly, a tighter and denser sampling of German, Polish and Czech individuals from regions surrounding the Sorbian territories would be ideal for confirming or refuting the results found in this study. Other researchers have confirmed the importance of representativeness. The HGDP dataset produces crisp and clean clusters in comparison to the POPRES data set, probably because the latter is much more cosmopolitan and urban-focused. These results don’t really resolve the issue of the relationship between the Sorbs and the Germans of the east, though they are suggestive as the two deviated Germans are both of eastern provenance. In the future with richer coverage of regions we’ll be able to tease apart the impact of geography and culture far better. I suspect that geography is the biggest predictor, but, when you see deviations from the geographical trend line think culture. Geography is ahistorical. It is culture which is a tied together with history. So to reconstruct the past, near and far, we are implicitly or explicitly navigating the superstructure of culture, whether it is concrete and living (as the Sorbs are) or simply shadows long forgotten. More to come!